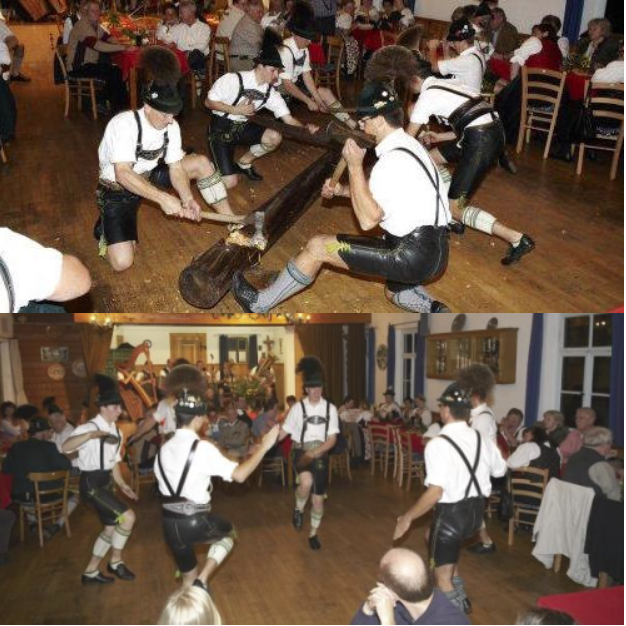 Book a Bavarian Show in Germany for your corporate event, your private party, wedding or birthday celebration. Many people abroad, once asked, what pops into their mind first, when they think of Germany, is beer drinking Oktoberfest music, people with leather pants, drinking loads of beer and wearing funny hats with a feather, always ready to party. Now is that so wrong? Of course, it certainly is. Germany is a high tech country and people you see in the street will most likely wear a business suit rather than leather pants and in theit hands, rather than a big hump of beer they will probably carry a cellphone. Despite of the speed of actually real German live is like, specially in the citys, there ist still a great deal of tradition being kept and celebrated as a counterpart to modern times. Bavarian shows seem a bit ancient at first. Than again, they are something, where people just have fun and relax from every days tension. So – once in Germany and one of your things to do on the list, is to organize a party with typical Bavarian music, there is no way around an authentic Bavarian Show from Germany. You will find many bands that offer the style of Bavarian oom pa pa music. The very best though, is to get a Bavarian band from Bavaria. They will sound original and be authentic. Now – how to hire a Bavarian Show in Germany? Some people think, and they are not even wrong about that, Bavarian musicians are some older men and women, staying around their village, never moving elsewhere. Therefore, there are a few Bavarian “travelling bands” for hire throughout the country. First of all, we highly recommend to book or hire us, a Bavarian Show in Germany as soon as possible. The reason is, that most people organize their events up to six months or more in advance. There are not too many, real authentic Bavarian Shows in Germany. So, if you don’t want to end up with a second choice Oktoberfest band, best to give us a call soon as possible. Depending on the size of the location you plan to party in, we either can bring our own sound-system if the location is not too big. In case it’s a hall, we might have to rent the gear. No problem though. Most every German city has places, that are fully equipped even for bigger events, with everything it takes to make it happen. As a matter of fact, most hotels, tow halls and bigger locations, usually provide their own gear. Besides – most enquiries are for corporate event entertainment. You want the “real thing”, unplugged, authentic Bavarian and right next to you? This is something, that has a lot of charm and of course we offer that. Better even, both. The stage show and after all, unplugged in-between your guests or co-workers and really let it happen. As one of the most authentic Bavarian Shows in Germany, we’d love to meet you.